Additional Info: This is a type of metaplastic breast cancer that is very easy to miss. The H&E resembles a fibromatosis or scar. It is also sometimes interpreted as ruptured cyst or fat necrosis. A very important feature of this tumor is that the tumor cells are positive primarily for high molecular weight cytokeratins. 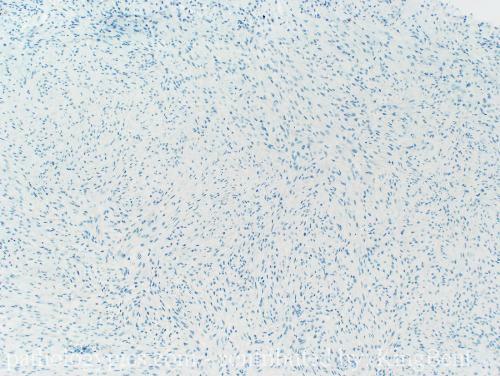 The two immunostains here are cytokeratin 7 (completely negative) and cytokeratin 5/6 (positive). If you don't remember to do the right CK in this tumor, you can miss the diagnosis. KingBent's "Breast Cancer Case 1" folder.